It doesn’t get much better than this, does it?! The Salmon League—currently in the midst of the most competitive year in league history—is coming down to the wire. With one week left to determine who heads to the Promised Land that is the SLB Playoffs and who is resigned to the Consolation Bracket and the battle for draft pick supremacy, we’ve got some amazing matchups with more than pride on the line in nearly all of them. These two have been jockeying for position atop the standings all season long and now with just days remaining, they get to go head-to-head with everything on the line. Mike gets stud outfielder Nelson Cruz back just in time for the matchup and Steven is dealing with a roster full of players suffering from nagging injuries and recent ineffectiveness. As such, there is definitely a legitimate possibility that we see Mike take back the top spot before the final bell on the 2010 SLB regular season sounds. I’d be lying if I didn’t say I expected them both to come back down to earth after their torrid starts and although their respective numbers have dipped (no one really thought they’d finish with a winning percentage above .700, did they?!) both teams have remained at the front of the pack and must be considered favorites heading into the playoffs. With a mere 5.5 games separating these two behemoths, the final head-to-head matchup between the two figures to determine the league’s regular season pennant winner as well as the recipient of the bonus $15 for taking home the regular season crown. 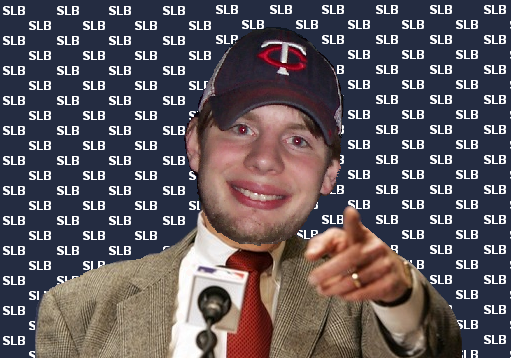 Expect a heated (and undoubtedly wordy) battle for SLB Supremacy this week. Although it may be a little too late for InSaNeAuDiO to crack the playoffs, G-Doggy’s club can still play spoiler and keep the Genies from qualifying with a big week. It is a shame to see InSaNeAuDiO on the outside looking in after such a tremendous start to the season. The club was soundly in third place and was carried by the MVP caliber performance of Miguel Cabrera and some breakout seasons by Kelly Johnson and Jose Bautista. Unfortunately, the usual suspects: “lack of time” and “lack of internet” came back to haunt G-Doggy’s club once again. An absolute drubbing (14-0-0) against SL Disappointment two weeks ago put InSaNeAuDiO back in the playoff mix, but a disappointing 6-7-1 week against Radioactive Rush pretty much sealed G-Doggy’s fate (barring another of those 14-0-0 kinda weeks). For now, a big win would give G-Doggy the first-round bye in the consolation bracket and a chance at gaining the first draft pick priority in next year’s draft. It is also a week that the Genies need to win if they intend to have any shot headed into the playoffs. On the surface this matchup doesn’t appear to have a whole lot on the line, but given the complexities of the league this year, there is still “technically” a wide-open race for the final two playoff spots. Grant’s new-look Rush squad is sitting tenuously in sixth with seasoned SLB veteran cracker jack and the aforementioned InSaNeAuDiO nipping at his heels. Making this all the more interesting is that just last week in one of the bigger pre-deadline moves Grant traded BOTH of his preseason keepers (Chase Utley and Victor Martinez) to Craiggers for the hot hitting Joe Mauer. Now, just a week later, that move could come back to cost Grant a trip to the postseason. Craiggers made some very shrewd trades before the deadline, ultimately positioning himself for a big run in the consolation bracket and setting himself up to have a fine selection of potential keepers. If Craiggers—and Grant’s old keepers—can put together another big week, Grant’s short-sighted trade could be his own undoing. I’d be remiss if I didn’t mention this matchup. Last year’s rookie sensation, The Collin Brand, has fallen on hard times—as will happen when you waste a first-round pick on Alexei Ramirez—and the club is circling the drain. Additionally, a questionable trade of franchise player Ryan Zimmerman for a second first baseman made little sense and did nothing to push the franchise back into the playoff race. This is an interesting matchup because Justin brought Collin into this league and it could very well be Collin that keeps Justin out of the playoffs. It is already a foregone conclusion that cracker jack will need some help from both Sea Bass v5.0 and InSaNeAuDiO if the club has any chance of cracking the postseason fray. It is, however, also a must-win week for cracker jack. It’s not exactly a win and you’re in situation, but it’s definitely a don’t win and you’re not in situation. To the other matchups Dome Dog (3) vs 38 MPH Heaters (10) and j’s team (4) vs S.L. Disappointment (12), I mean no disrespect, but there really isn’t a whole lot on the line here. The matchup between Adam and Morgan is intriguing as it’s always fun to see two new teams clash late in the season, but with DD have already clinched, there ain’t a whole lot going down that means much here. The Jay vs Johnny matchup is about as intriguing as any matchup with Johnny has been this season. If the few good players on Johnny’s team get hot he could surprise us, but with Ryan Howard still scuffling since a return to the DL and Johnny’s squad still running out the likes of James Loney and Ryan Theriot as everyday regulars, this one is likely a foregone conclusion. With that, I say good luck to everyone (except G-Doggy) in this season’s final week.